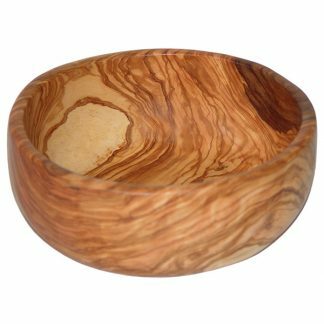 From Spain offers hand carved olive wood serving bowls and salad bowls in unique sizes and shapes. 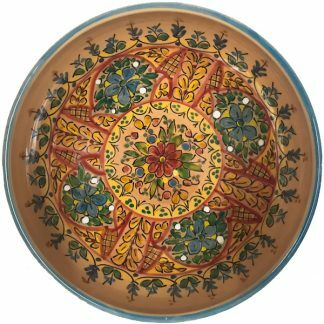 Our large ceramic serving bowl is one of our best selling pieces due to it´s practicality. 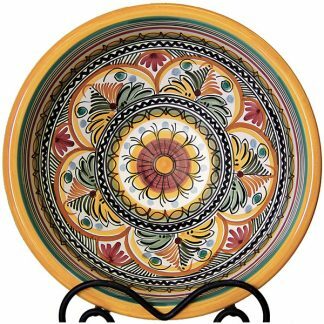 It is an ideal mixing bowl, salad or pasta bowl. 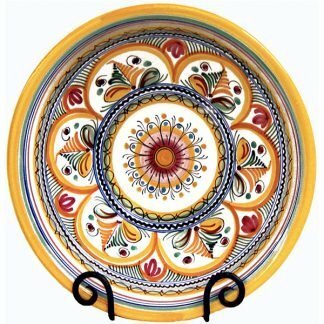 Each piece is individually hand painted and signed by the artisans in Spain. Holes on the back rim allow for hanging. Makes a great serving set and nests nicely inside our largest Serving Bowl Especial. Olive wood has a beautiful grain, is extremely durable and does not absorb odors or stains like many other woods. 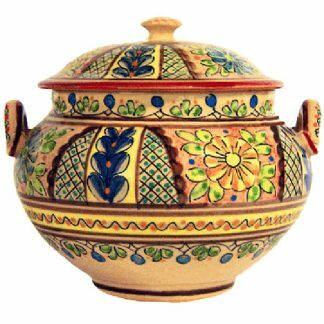 It is very strong which makes it a good choice for cooking utensils and serving bowls. Our olive wood products are individually, and exquisitely, hand crafted in Navarra, Spain by the Pimfa woodworkers. Each piece comes from one block of olive wood, which now has very limited availabilty. Their smooth finish feels wonderful to the touch and their intricate patterns are a true thing of beauty. Since they are carved from the natural wood, each piece will vary in shape and texture. This 12″ bowl is a great size for serving salad or is wonderful used on the counter as a fruit bowl. The Serving Bowl Especial is our largest sized bowl. 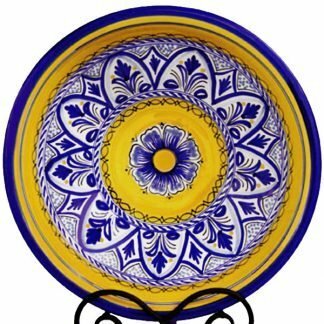 It nests nicely and makes a great serving set with our Large Serving Bowl. Use them together to serve pasta and salad. 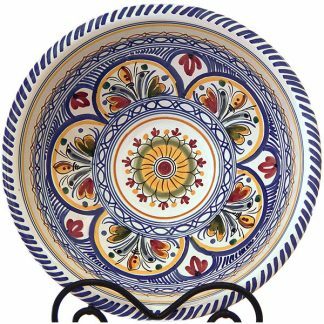 Each piece is individually hand painted and signed by the artisans in Spain. Holes on the back rim allow for hanging. 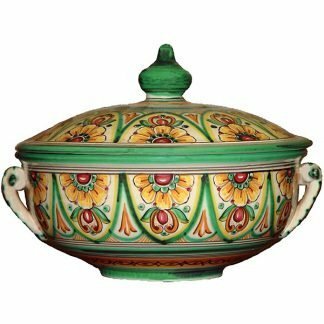 This elegant and unique ceramic tureen serves many uses. Use it for soup and chowders, for serving side dishes, or even as a cookie jar! Each piece is individually handmade and hand painted and therefore no two pieces will be alike. Every piece is signed by the artist in Toledo, Spain. 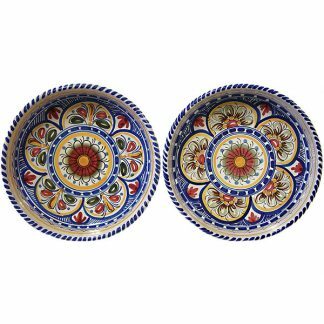 The flat bottom and high sides on these ceramic bowls make them perfect for a large individual salad, stew or pasta, as well as for serving side dishes. 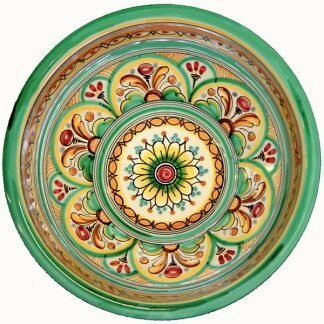 Each bowl is individually hand painted and signed by the artisans in Spain. The unusual shape of this bowl, along with its natural markings, make it especially beautiful. Our olive wood products are individually, and exquisitely, hand crafted in Navarra, Spain. Each piece comes from one block of olive wood, which now has very limited availabilty. Their smooth finish feels wonderful to the touch and their intricate patterns are a true thing of beauty. Since they are carved from the natural wood, each piece will vary in shape and texture. 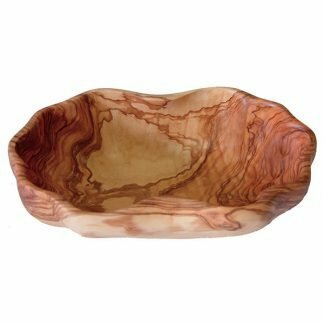 This bowl measures approximately 13.5″ long bowl by 8″ wide and is great for serving salads, chips & pastas. 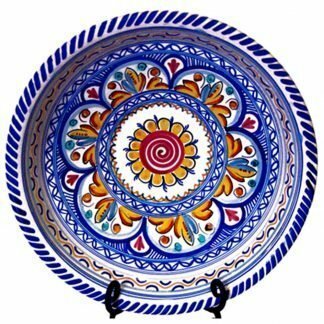 Our large ceramic serving bowl is one of our best selling pieces. 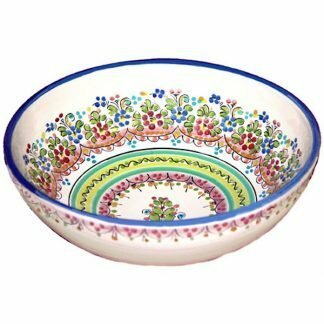 It´s practical size makes it an ideal mixing bowl, salad or pasta bowl. 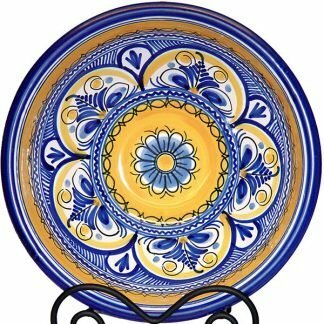 Each piece is individually hand painted and signed by the artisans in Spain. Holes on the back rim allow for hanging. Makes a great serving set and nests nicely inside our largest Serving Bowl Especial. 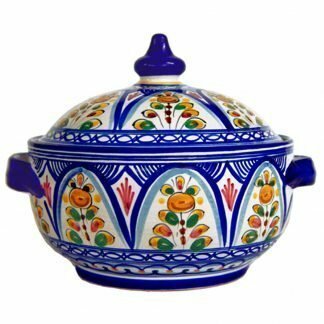 Individually handcrafted and signed by artisans from a small family owned factory in Spain, the size of this bowl makes it ideal for serving chips or salads and pastas. 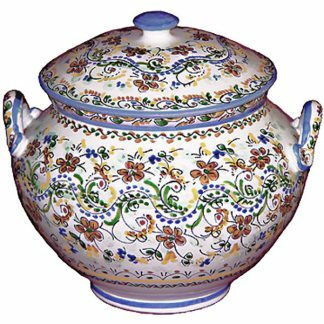 This intricately painted ceramic soup tureen is sized for serving small side dishes or individual portions. It makes an elegant bowl for serving soup or stew at each place setting. Each piece is individually hand shaped and handmade and is signed by the artisans in Spain. 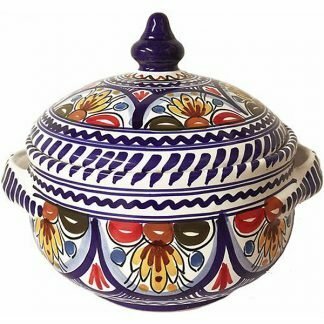 This covered serving dish is an exquisite piece for serving everything from mashed potatoes to the traditional Spanish dish arroz con pollo. Each piece is hand shaped and handmade and is signed by the artisans in Spain.